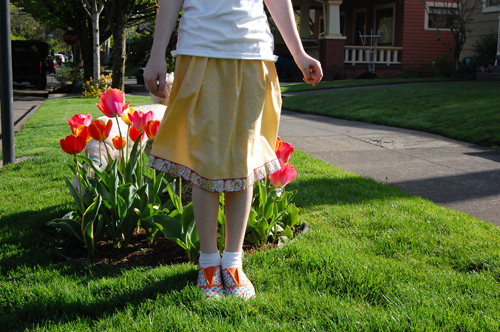 For years the kind folks over at Oliver + S have provided a free, downloadable pattern for sewing up a darling skirt with ribbon trim. I have loved seeing all the variations of this skirt, and the delight it brings particularly beginner sewists to have such a beautifully finished garment made so easily and quickly. This skirt took me an hour to make, no lie. It calls for whatever length you want, plus two inches. I cut a 5/8 yard piece for this one. The most fun is the ribbon finish at the hem. It’s such a clean and fun way to finish the skirt’s hem and get to use some of those fabulous trims at the store that you’ve been eyeing and haven’t quite know what to do with. I used the wide, Kaffe Fassett lotus leaf ribbon for this project. Heather did a sweet and simple embelishment on a store bought tee to make a coordinated outfit. Perfect for any spring gathering! You can find the pattern instructions here and can see some of the latest pretty trims we’ve received here and here. Easy peasy, time to get stitchin’.